How To Get To McKinley Hill and Venice Grand Canal Mall? 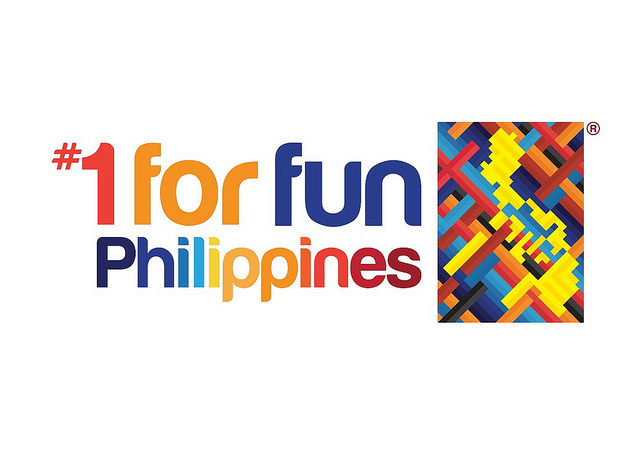 1. Business complex that includes One World Square, McKinley Hill Cyberpark, and Commerce and Industry Plaza. 3. Educational institutions such as Chinese International School Manila and Korean International School Philippines (both found in Upper McKinley Hill), and Enderun Colleges, an international hotel school located at Park Avenue, and Mint College. 6. Blue Leaf Paviluon, an events place. 7. McKinley Hill Botanical Garden and Town Center. Option 1. From EDSA, ride a bus southbound to Baclaran or Ayala or take an MRT and go down at Ayala and look for the jeepney terminal (under MRT station) and ride those that are bound for Market Market. Get down at the corner of Fifth Avenue and McKinley Road and look for jeepneys bound for FTI Gate 3. This will pass by McKinley Hill. Option 2. From EDSA, ride a bus southbound to Baclaran or Ayala or take an MRT and go down at Ayala and look for the bus terminal of TheFort buses (at the gate of Forbes across Shell Station) bound for Fort Bonifacio. These are air-conditioned buses that go around Fort Bonifacio. Get down at the corner of Fifth Avenue and McKinley Road and look for jeepneys bound for FTI Gate 3. This will pass by McKinley Hill. Option 3. From EDSA, ride a bus southbound to Baclaran or Ayala or take an MRT and go down at Guadalupe. There are jeepneys in Gaudalupe that are bound for AFP Housing and Fort Bonifacio. You can ride either of the two, both of those routes pass by McKinley Hill. Option 4. From the C5 area, ride an FX or jeepney going to Kalayaan Avenue and go down at the intersection of Kalayaan and C5 (this is called "Buting"). There are jeepneys bound for Market Market from that corner. From Market Market, ride the jeepney that is bound for FTI/Gate 3, these jeepneys pass by McKinley Hill. Option 1. From EDSA, ride a bus northbound to Fairview or Monumento or take an MRT and go down at Ayala and look for the jeepney terminal (under MRT station) and ride those with signboard McKinley-Fort-Bonifacio-Gate 2 that are bound for Market Market. Get down at the corner of Fifth Avenue and McKinley Road and look for jeepneys bound for FTI Gate 3. This will pass by McKinley Hill. Option 2. From EDSA, ride a bus northbound to Fairview or Monumento or take an MRT and go down at Ayala and look for the bus terminal of TheFort buses (at the gate of Forbes across Shell Station) bound for Fort Bonifacio. These are air-conditioned buses that go around Fort Bonifacio. Get down at the corner of Fifth Avenue and McKinley Road and look for jeepneys bound for FTI Gate 3. This will pass by McKinley Hill. Option 3. From EDSA, ride a bus northbound to Fairview or Monumento or take an MRT and go down at Guadalupe. There are jeepneys in Gaudalupe that are bound for AFP Housing and Fort Bonifacio. You can ride either of the two, both of those routes pass by McKinley Hill. Option 4. From EDSA, ride a bus northbound to Fairview or Monumento or take an MRT and go down at Magallanes. Walk towards the San Lorenzo Place Showroom at the corner of Pasong Tamo. Look for the bus/FX terminal which are bound for McKinley Hill. There are jeepneys in the Ayala terminal (under MRT station) that are bound for Market Market. There are also jeepneys plying the Ayala route going to Market Market. Get down at the corner of Fifth Avenue and McKinley Road and look for jeepneys bound for FTI Gate 3. This will pass by McKinley Hill. Option 1: Go to the San Lorenzo Place Showroom at the corner of Pasong Tamo and EDSA. Look for the bus/FX terminal which are bound for McKinley Hill. Option 2: There are also jeepneys passing along Pasong Tamo/Mantrade/WalterMart (along Pasay Road) that are bound for FTI. Ride the one that goes to Gate 3. From Gate 3 or end of Pasong Tamo Extension, there are jeepneys bound for Guadalupe, passing by McKinley Hill. There are jeepneys in Gaudalupe that are bound for AFP Housing and Fort Bonifacio. You can ride either of the two, both of those routes pass by McKinley Hill. Ask the driver to be dropped at McKinley Hill or One World Plaza. If you are in the Taguig or Paranaque area, ride a jeepney going to Nichols in Taguig, ask to be dropped off the Gate 3 - where the jeepney terminal to The Fort is located. From Gate 3 , there are jeepneys bound for Guadalupe, passing by McKinley Hill. For private vehicles: McKinley Hill is just along Lawton Road that connects South Super Highway (via FTI/Nichols/Villamor Airbase exit) and Bonifacio Global City. It is also accessible through C5 via the McKinley Hills gate past the exit of Market Market/The Fort in the southbound lane. The area can also be accessed through EDSA northbound using either a) Kalayaan Avenue b) McKinley Road going to Forbes by the Ayala corner or c) C5 flyover coming from Buendia. It is advisable to just approach via Lawton Road since this road is not too traffic heavy yet compare to C5. 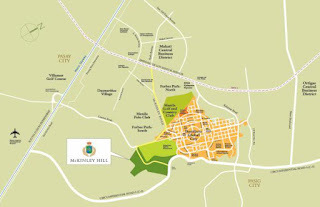 Of course, you can ride a taxicab from any area around the metro and just mention "McKinley Hill" or "Venetial Mall" and the driver already knows where to go. View McKinley Hill via Google Maps. Other landmarks and structures around McKinley Hill: The Fort/Bonifacio Global City, American War Memoria, Lawton Road, C5, Philippine Army Headquarters. 148 Responses to "How To Get To McKinley Hill and Venice Grand Canal Mall?" thank you so much. This is a great help.. This is soooooo helpful. Thank you so much for taking your time to do this. May 24, 2010 at 10:09 AM This comment has been removed by the author. Just wanted to ask about the transpo to McKinley Hill from Makati... Does the Fort Bus reach the area? Also, how scarce are taxis from McKinley Hill to Ayala? Please help: From UST, how do I get to the Korean Embassy? Thanks a lot. thanks...a big help for me..
hi there cn u let us know the time of the availability and the price of bus fare or shuttle if there is indeed going to one world square specifically i will be coming from antipolo i need to know asap thanks much! hi im sorry i needed a detailed direction/instruction as how to reach One World Square Bldg. coming from Antipolo City, detailed meaning if the transpo is on a 24/7 operation or what thank you very much using the public transpo and private as well . Hi.. Would you be able to give me direction (without private vehicle) as to how to get to Rosewood Pointe at Taguig from Eastwood City? Hi! Is it safe at night to get off at the corner of Fifth Avenue and McKinley Road and wait there for jeepneys bound to Gate3? Nice blog here. 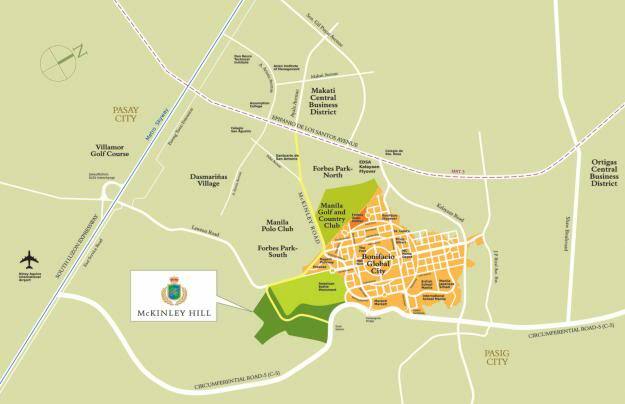 I was just wondering how to commute to McKinley Hill Town Center from San Pedro, Laguna? What bus should I ride? If possible please provide a detailed instruction. Hehe. Thanks! Thanks a lot... That was just all the info i was looking fir... Great help. thanks again. hi! i'm from dasmarinas cavite and i would like to know what's the most convenient way to mckinley t.c. in terms of fare and time spent for commuting.i'll be working there and it would be a big help if i could save time and money. thank you so much! Is it any transportation that goes from the 3rd ave. inside the fort (mckinley park residences) down to mckinley hill? gud eve.ask lang po qng effective na po ba ang number coding? Could do with some Hotels in the Mckinley Hill area advertisements. There's actually a bunch of FX/Vans at San Lorenzo Plaza (Pasong Tamo entrance, across Alphaland) which all go straight to McKinley Hill. The fare's only Php 25. This is more convenient than the jeepneys because this really drop you off at your location - for example if you need to go to the Korean School, British Embassy, or sometimes even the Korean Embassy. If you're from the south (Batangas, Laguna, PQUE, etc.) buses A and C drop you off at Magallanes bus stop or near the Magallanes PNR Station. You can walk a bit towards San Lorenzo place from there. If you're a bit adventurous too, you can try the habal-habal (motorcycle passenger) at the Ayala MRT Station, just below it. It's only Php 40 from Ayala to wherever you need to go in McKinley Hill. This is a legitimate company that runs habal-habals in Taguig and Makati, so it's safe and very fast, too! Hi how much ba ang price sa taxi from airport to fort bonifacio? and mayroon bang pension house that 500 a day? or less? near korean embassy in taguig? thank you..
pls po...from cavite po ako...so f baba po ako ng baclaran,...what next sasakyan ko papuntang qatar embassy? Alam nyo yung Citylink bus na may route from Eastwood city to NAIA Terminal 3 and vice versa. May nakakaalan ba ng sched ng byahe from New Port City bus stop(one of their bus stops) to McKinley Hill bus stop. Papunta kasi akong Emperador Stadium inside McKinley. Please help me. Sabi kasi mas convenient ang Citylink bus kasi papasok talaga sa loob ng McKinley Hill. Salamat sa makakatugon! hi! how do i get back to ayala naman from mckinley (3 world) without taxi? hehe thanks! May fx or bus prn po ba s may San Lorenzo pag saturday? Visions of decorating it the way you want, entertaining friends on Friday nights, and maybe even raising a family, almost always come with this decision. Bask in an elegant and classic Mediterranean environment in Megaworld's McKinley Hill at The Fort. A unique township development with the country's first ever man-made Grand Canal, it also offers complete modern amenities for growing families. Sino po nakaka alam kong pano pumontang Royal Norwegian Embassy sa makati?thanks po and God bless. This is seriously a great help! Do you have like this in all metro manila areas?? Wow!!!! Hi can u tell me how to get to Twenty-four Seven McKinley in BGC from pasong tamo? How to get in venice grand canal mall using private car from edsa? how to get to IPO office in upper McKinley road if im from PNR Nichols station. I need an asap answer please .. thanks. Most cut road to venince .. Las Piñas to venice taguig McKenley vehicles is motorcycle..
March 20, 2016 at 7:49 PM This comment has been removed by the author. Do you have a direction from Megaworld Alabang west village? From monumento, ano po sasakyan? At magkano po bayad sa taxi kung monumento ka sasakay. Salamag po sa sasagot. Hi, Paano po makarating ng Mckinley Hill by commuting, galing Cavite. hi paano po pumunta sa mckinley galing cavite? Tanong q lng po paano pumunta sa Venice grand Canal galing Paranaque City? Salamat po sa sagot. Hi, if you are coming from makati or ayala. There are UV express bound to mckinley hill in Park Square beside SM Ayala and Dusit Thani, it's on the 2nd flr building. Hope this helps. Fare is 25pesos. Hi how to commute from Pateros goin to Commerce & Industry plaza campus ave taguig? . jika anda ingin menggunakan aplikasi bbm dengan berbagai tema silahkan kunjungi blog bbm terbaru. Your post is truly cool and this is an awesome motivating article. Anu po sasakyan kapag galing cavite city?? This is an awesome post. I like this topic.Your mode of explaining the whole thing in this article is genuinely pleasant. I can set up my new idea from this post. It gives in depth information. Thanks for this valuable information. August 24, 2017 at 5:07 AM This comment has been removed by the author. From Market Market taguig. How to get to upper mckinley? Bus? Hi ,gow to commute there from antipolo po? Thanks! Very informative post. Anyway, you should also try to visit Glorietta. I'm sure you'll love it too. And if your are commuting around 7am to 10am from starmall alabang ulet nakapila sila sa terminal sa loob. And if alanganin ang sked na punta mo cavite to magallanes/mantrade from alphaland tumawid ka sa kabila going to a newly opened condo san lorenzo place. May van doon 25 pesos around mckinley hill na. however they are not functioning. You will certainly wind up kodi for iphone without jailbreak "Trust" your computer system if you did not execute this. Great stuff here, Thanks for the info! Hi, I'm from Calamba, Laguna. As a commuter, Is there an easiest ride where i can go there? May ENTRANCE po ba jan??? Using private vehicle, are there certain traffic rules in BGC? kng baba ako sa nichols station ng pnr how to get there to venice grand canall mall thanks in advance..
Hi ask ko po? Pano po pumunta nga mckinley vinice canal mang gagaling po kami valenzuela commute lang po pano po ba? This is very helpful! Thanksss!! how to get there from alabang? At least 200. Pero depende pa rin sa kung anong oras ka bbyahe. S sucat po b my skyan ppntang McKinley Venice? hello paano po pumunta sa venice grand canal mall kung mangagaling ka po ng mcu monumento ? Pano po kung galing ng sta.maria bulacan? San po ung uv sakayan papuntang venice taguig.mckinleyhill from makati?